Ingenious Design Studio has utilized every inch of a small space to create a functional design for their offices located in Karachi, Pakistan. Ingenious Design Studio has completed their new office on the theme of spacious planning in a small space. For designing a space they found inspiration through their own processes of design. 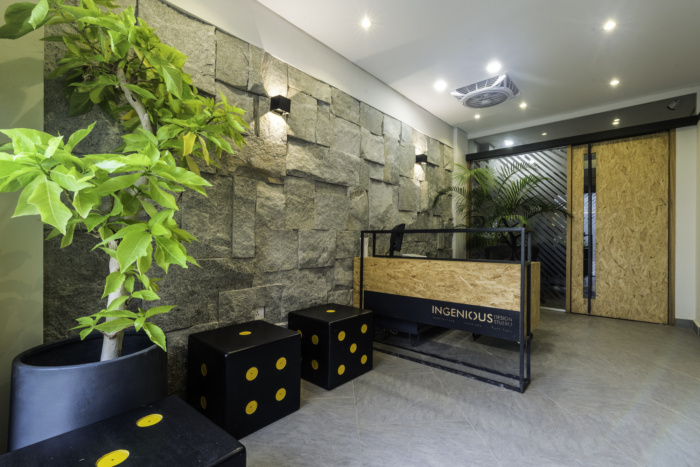 The reception area is designed with contemporary furniture and seating dice which has a unique way of cladding stones that is elegant and welcoming. Creating multi-functional spaces was a key consideration of a more efficient use of office space. The furniture is minimalistic and arranged in a way so space can be utilized optimally. The meeting room is spacious with an abstract patterned feature wall with carpet tiles. The studio has a great combination of aesthetic appeal and functional space. Glass partition walls give a sense of flowing spaces and visual continuation. The studio facilitates open communication among employees, better coordination and optimum working space. Ingenious Design Studio deliberately created almost the entire interior from Oriental Strand Board (OSB) that includes a reception counter, meeting table, workstations, hanging cabinets, hanging lights and clock. The main idea is to make the office economical, innovative, elegant, sustainable and easy to maintain.